In 2102, on the planet Dasgoaar, a lizard-like teen named Ajum-Tah finds an ancient artifact in the wreckage of a spaceship. While being chased by a group of mercenaries, he flees his home planet in search of The Council, a mysterious group that holds the answers to his questions. Meanwhile, on Earth, a 16 year old girl named Ching Shih is attempting to escape the science lab in Charlotte, NC where she was created and raised. At the same time, teenager Isambard Tims is fleeing a life under the thumb of an overbearing religious zealot. Along the way, he befriends Outis, a seven foot tall Cyclops who is kept as a slave for the intergalactic, traveling Dr. Imagitron’s Carnival of Wonders. 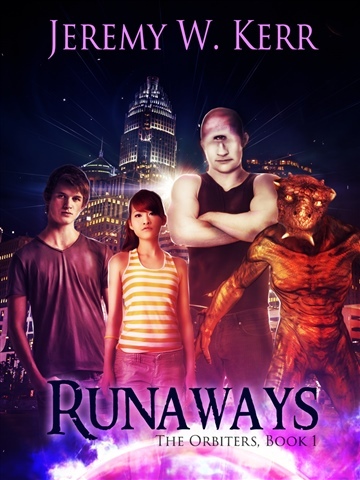 When the four runaways meet, they assume it is by chance. But as their pursuers begin closing in around them, they realize that what looks like luck may actually be the result of the artifact itself. "One of the hidden beauties of this [novel] is how well so much of the exposition is crafted into the story without pointing it out." "I love science fiction and I love YA fiction, so this started out appealing, but that doesn't carry a book for me. Kerr has done truly excellent world building. The characters are sympathetic and believable. The pacing is great. And best of all, once I finished reading Runaways, I kept thinking about the story and the the characters long after I was reading my next book. I'm eagerly awaiting the next volume." "I'm not usually a Sci-Fi fan, and I'm definitely not a YA, but I loved this book. This writer's imagination takes me to places I would have never gone otherwise! Travel ahead in time and across the universe to other worlds."